AllegroMedical.com presents The Steel Folding Frame Commode. Using the bathroom shouldn't be a difficult chore. If reduced mobility makes getting to the bathroom a challenge, a home care commode can be a necessity. The Folding Steel Commode from Drive Medical can be easily setup in any room of the house for ultimate convenience. In addition, it can be used without the bucket and placed over an existing toilet as a secure, raised toilet seat for those who have difficulty bending to sit on a standard toilet. 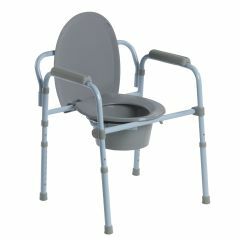 The Folding Steel Commode also makes a great toilet frame offering assistance when sitting on, or standing up from, the toilet. The durable, easy-to-clean unit features simple snap-button assembly that allows the commode to be disassembled for storage or transport. Easy push button height adjustment places the seat at the ideal level for you. The 7.5 quart commode bucket includes a convenient carrying handle, a cover and a splash shield. The commode also features plastic armrests for extra comfort and superior grip.